Back in the good ol’ days, luxury cars used to be truly bespoke. Using a process known as coachbuilding, their bodies were lovingly handcrafted, allowing the most discerning customers to create the ultimate in personalised transport. In the 1920s, Rolls-Royce was one of the foremost proponents of these coachbuilt cars, creating a raft of stunning, unique limos for society’s high rollers. Over the years, this style of luxury automobile gradually faded away though as the new manufacturing techniques used to construct modern cars made coachbuilding a prohibitively expensive venture, even for the über wealthy. Not expensive enough for one customer though. Debuted over the weekend at the Villa d’Este Concours, this one-off Rolls-Royce ‘Sweptail’ reportedly cost somewhere in the region of $13 million. That makes the 115-foot Porsche yacht we featured a few weeks ago look like a bargain. However, like the cars of yesteryear, this new Rolls-Royce is, from the front bumper to the rear lights, entirely bespoke. Without a shadow of a doubt, there will be nothing quite like it on the roads (if it ever gets to see tarmac under its tyres, that is). 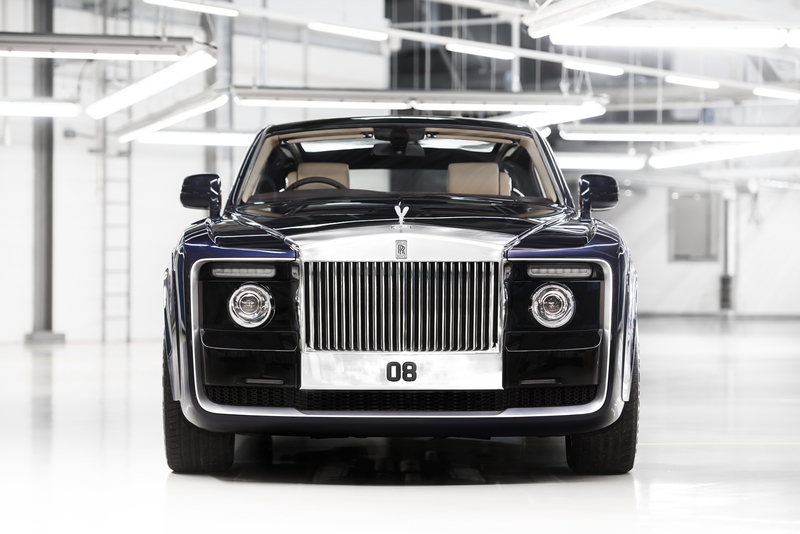 Taking its inspiration from the golden age of bespoke Rollers, the Rolls-Royce Sweptail marks a return to true coachbuilding for the team at The Drive. Commissioned by a client besotted with 1920s and 30s Rolls-Royces, the Sweptail project began back in 2013 with a brief to create a one-off motor car like no other. The end result has seen the British manufacturer leave no stone unturned in its quest to create the ultimate bespoke automobile. For example, the trademark Pantheon grille is the largest ever fitted to a RR car and was milled from solid aluminium before being hand polished to a mirror finish. Of course, the most striking element of the Rolls-Royce Sweptail is its sweeping silhouette, topped by a huge panoramic glass roof. The elegantly stretched and tapered tail contrasts with the chiselled front end to create a dramatic new coupe shape. 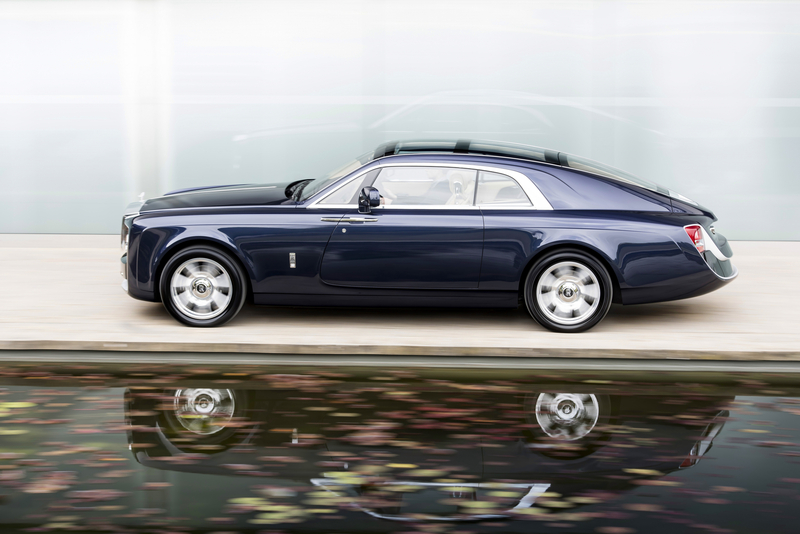 Rolls-Royce has painstakingly ensured that the finish is worthy of the astronomic price tag too, wrapping the body underneath the car to make it look like there are no visible join lines between the chassis and the panel work, just as would be done on a luxury yacht. The interior – bathed in natural light from the glass roof and one of the largest and most complex ever fitted to a car – is similarly unique. Constructed as a touring two-seater, the cabin mixes light and dark with the use of polished ebony elements and open-pore Paldao wood. The switchgear has been kept to a minimum too, accentuating the simple elegance of the Sweptail concept. In place of the rear seats sits a palatial luggage shelf named the Passarelle. Sculpted into a teardrop shape, it again evokes the style of classic yacht decks and is gently illuminated with a glass lip. Topping off the luxurious interior (and confirming the car’s touring credentials), the Rolls-Royce Sweptail comes with its own bespoke attaché cases, constructed from carbon fibre and housed inside hidden panniers, as well as a full-set of leather luggage cases. Coupled with the myriad of other personal touches, the mind truly boggles at the level of work the Rolls-Royce team has had to put in to get the Sweptail just right. 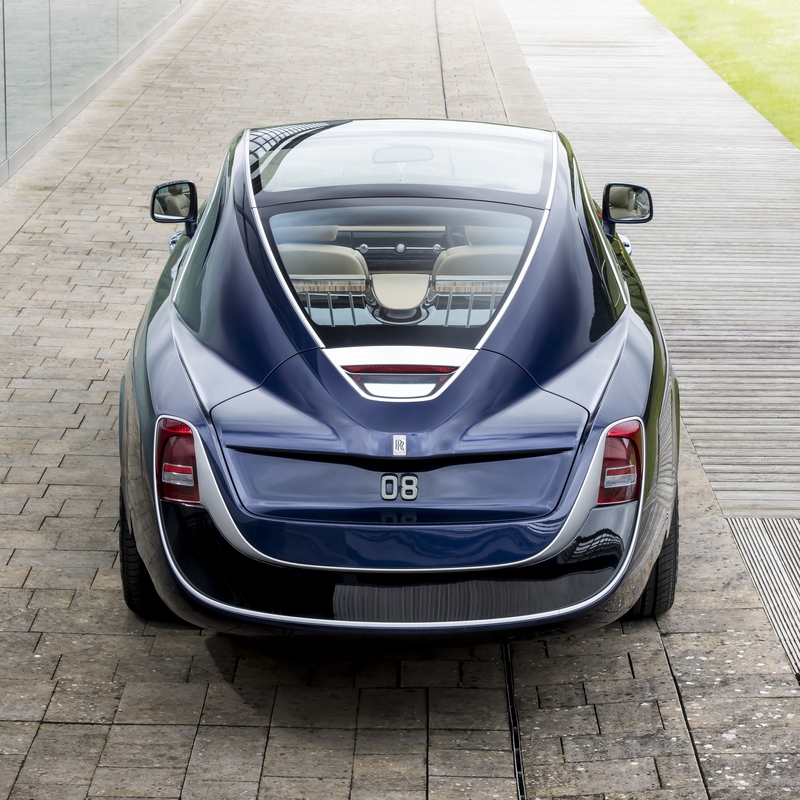 “Sweptail is the automotive equivalent of Haute Couture,” explains Giles Taylor, Director of Design at Rolls-Royce Motor Cars.